Daily Illuminator: Dueling Wizards, Tricky Technomystics, Terrible Tomes, And More! June 9, 2016: Dueling Wizards, Tricky Technomystics, Terrible Tomes, And More! One of the first decisions many GURPS campaigns face is deciding what kind of magic is in the world, and how to make it more magical. 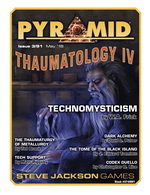 Your options just got expanded, with Pyramid #3/91: Thaumatology IV, the latest issue of the long-running Pyramid magazine. This installment includes an expansion of GURPS Magic that describes a Metal college of magic (including dozens of new spells). The issue also features a new magical art form for GURPS Monster Hunters -- technomysticism -- that provides a new template, powers, and spirits, all with GURPS stats. But that's not all! This volume also offers a system for wizardly duels suitable for just about any GURPS magic system (plus GURPS Psionic Powers); dark alchemical brews from David L. Pulver; and much more. Whether you're looking for new rules, sinister background artifacts, additional options for your games, or inspiration for making your setting more exciting, Pyramid #3/91: Thaumatology IV has something you can use. Pick it up individually, or subscribe today for this and many more months of amazement.